This server provides access to Linked Data that describes the audio held in the Internet Archive’s Live Music Archive (also sometimes known as "etree"). The metadata from etree has been converted to RDF and is exposed through a SPARQL endpoint along with browsable pages. The dataset contains information describing over 100,000 performances by 4,000 artists including 1,600,000 individual tracks, each of which may be available in a number of formats. Artists are linked to entries in MusicBrainz, while locations of performances are linked to entries in Geonames and last.fm using a number of methods. Any such alignments are represented explicitly as similarities. A SPARQL endpoint for the data is available at http://etree.linkedmusic.org/sparql. Some sample queries running against this endpoint are linked below. Note that as this is currently an experimental service, query timeouts are limited. All artists in the collection. Artists and the locations of recorded performances. Artists with a count of their performances in the collection. There's a lot of Grateful Dead in there! The following query (click here to run it) retrieves a set of commonly performed songs by artists with between 200 and 1000 performances in the Live Music Archive. # tracks that are played more than 20 times. # Get audio files for multiple performances of a song. The Live Music Archive metadata is being made available under the CC0 1.0 Universal - "Creative Commons public domain waiver" license. Note that this only applies to the metadata supplied here. Links are given to audio materials for which other conditions may apply. 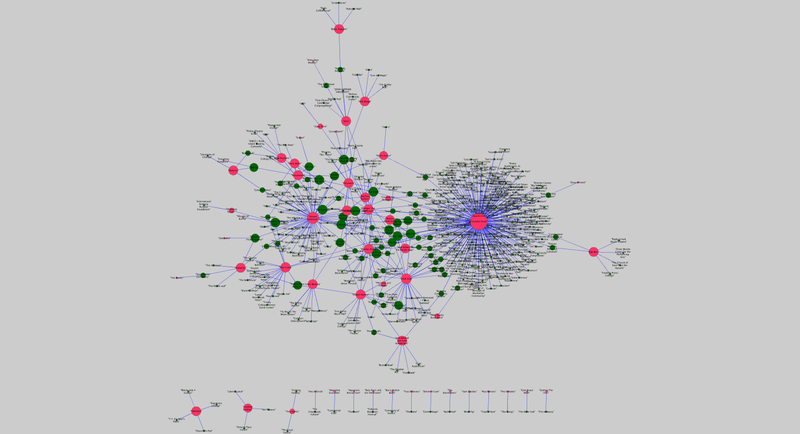 The figured below show some sample overview visualisations produced using Cytoscape. The first shows relationships between artists (pink) and the geographical locations (green) in which they have been recorded. 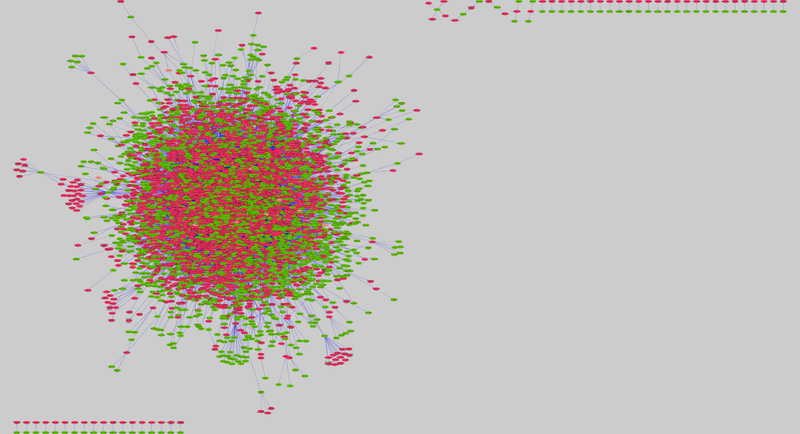 The second shows relationships between artists (pink) and mapped last.fm venues (green) in which they have been recorded. Slides from a presentation at DMRN+7, Digital Music Research Network One-day Workshop 2012. Sean Bechhofer, David De Roure and Kevin Page. Hello Cleveland! Linked Data Publication of Live Music Archives. WIAMIS: 14th International Workshop on Image and Audio Analysis for Multimedia Interactive Services. July 2013. The Computational Analysis of the Live Music Archive (CALMA) project aims to extend the etree data with computational analyses over the recordings through feature extraction, clustering, and classification. Sean Bechhofer, Simon Dixon, George Fazekas, Thomas Wilmering and Kevin Page. Computational Analysis of the Live Music Archive. ISMIR 2014: 15th International Society for Music Information Retrieval Conference. For more information, please contact Sean Bechhofer. We would also like to thank the Internet Archive for granting access to the source data.